This is the most difficult camera I've ever used from D-Link. I have several other models and never had any issues with them. Or installing them. They have been very reliable and easy to install. That is why I bought others. I bought 2 of the DCS-936L because of the size and the fact I can easily power it from USB (i.e. a LiOn battery pack). But I can't get the MyDlink lite app on my Android to install them. 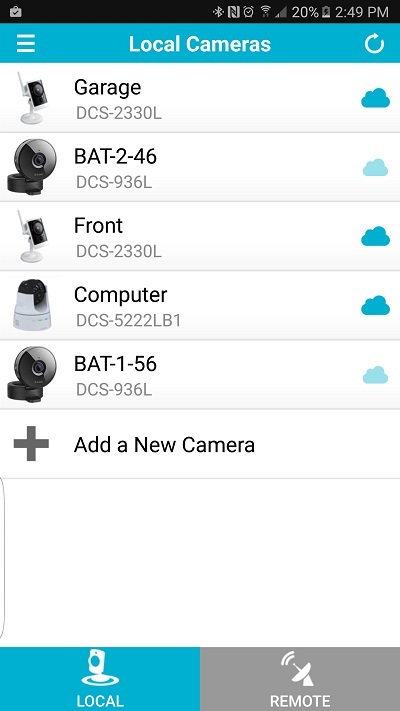 I did manage to get both cameras to connect to my WiFi, using the WPS button. And I can directly connect, using the IP addresses. I also did port forwarding, so I can access both directly from the internet. But can't get mydlink to see them. It appears the only way for the app and the MyDlink page to see them, is to go through the install process. But that fails, everytime. I get two kinds of failure. What FW is currently installed? Can you install the cameras using a PC to initially set up the cameras and get them associated with MDL? What Mfr and model router are you using? Firmware not issue. Have tried with what came with it and after upgrading. Same thing. Nope, must go through the app, to install these. They don't have Ethernet connection. Must setup through app before I can access the internal web pages. Linksys 1900AC. Not the problem. That's what I do. I always set the IP to static outside the DHCP range, so that it never changes. But as soon as I change the IP, and port forwarding, it breaks the app setup. About the only thing that's working in the app is the initial Wi-Fi connection. Even though it says can't connect, it loads the parameters so I can see what the IP is on my router and set things up manually. HOWEVER, I lose the ability to use MyDlink with it, after the IP are set to static. But as soon as I change to a static IP, things start to break. 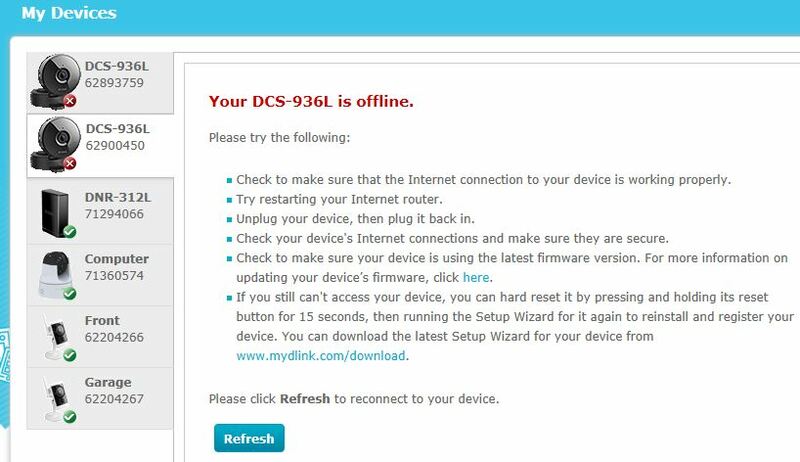 Mostly my MyDlink page no longer works on the PC and my smart phone only works local. That works fine direct access, either remotely or locally. And seems to work ok LOCAL with mydlink LITE but nothing from the web MyDlink or REMOTE with the LITE app. And there doesn't seem to be any way to get these working, without going through the install process, using the APP. And that's where the failures occur. There isn't any way to specify any of the ports, during setup. So they were changed by direct connection to camera, after install. Before changing ports, the MyDlink worked. But after I changed ports, they couldn't be connected to. That led me to think these cameras have to be on port 80 by default. But that doesn't seem to fix the problem either. All the other cameras had the ports changed after the install wizard and they still continued to work. Just not sure how the web form, or the smart phone app can know the ports, except from the cameras themselves. Somehow that information was transferred to the Remote access software ONLY at the install point. Anything changed after, loses that connection. At least that's the way it appears to work. This is my setup and you can see what part isn't working. External Port 9046 forwards to internal IP:80 and 4056 forwards to internal IP:80. The other cameras forward to ports other than 80. But I have tried using internal ports 9046 and 9056 with same results as using 80. I'm stumped. I have the LOCAL and direct accesses working. 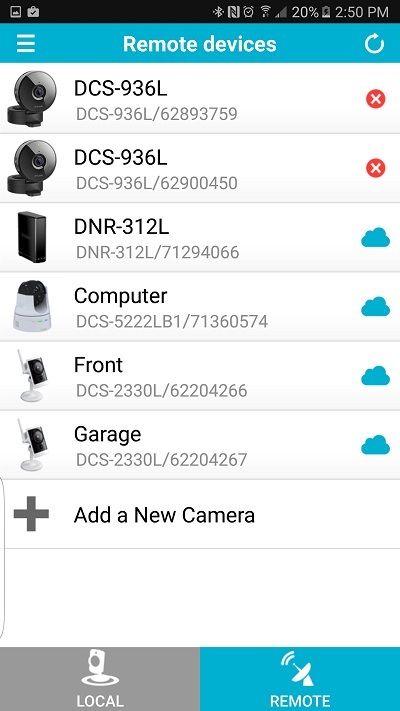 I'd think the app should be able to scan the local cameras and just transfer the into to the MyDlink website OR use it for the remote access. Seems to have all the info it needs. But doesn't seem to work that way. The other thing I wonder about is why there are two "Add a New Camera" one for Remote and one for Local. Seems that one should be enough. During the install, sometimes the Local setup would ask if I wanted to use the info for mydlink (remote I assume). But it didn't always do that. Actually, not really a duh! I still am not entirely sure why but it kind of makes sense. I was wondering how the MyDlink web site would possibly know what the internal port routing was. Either it had to be passed during install OR there had to be another way for it to know, outside of the camera. So I started looking at differences between what was working and what was not. I noticed a field in the Static IP setup that was blank, on the non-working cameras. On the other cameras, this field is filled in automatically, by default. On my 936L, it's left blank by default. I just entered 192.168.1.1 like on my other working cameras and everything started working. I think I've spent about 15 hours on this. It would be time well spent, but I'll probably forget about this, in a day or two. Glad you figured it out and got it working. Please be patient with me, I'm very new to forums. I am trying to connect to a DCS-936L camera with my ipad and/or iPhone 5s. Reading the note above, when I go to my camera IP address my settings for the camera gives me choices for DHCP/BootP/Static, under static I have choices for IP address, Subnet Mask, Router, DNS and Search Domains ALL of which are blank. I don't have a choice for Optional DNS. Any suggestions on what I can do to get the camera connected? Page 27 of the user manual, under Network ? Maybe let's back up a little - what are you trying to use to connect your ipad to the camera? Which application? That fixed the same problem I was having. IP on automatic, the myDlink+ app can't find it after reset from first set-up. I make a static IP with all DNS fields filled in then the myDlink+ app can see it. This has to be a bug, there should have been a firmware fix since this post is so old. My first camera seem to be bad, however it may have been the router I was using as I switched to a different router and even though the app took a bit to get going, it installed successfully. I found that you could use a PC if the PC is wireless supporting. It was the the user manual. So IE11 for Windows is best or FF ESR. I since have a replaced the first 936L, it's been solid. I never see any video streaming issues with either cameras. Just the first one had issues with one of my routers and will be sending that router back I think. I use a static IP address on all my cameras, not Dynamic. I have a 933L, 936L and a 960L. All currently connected to a DIR-880L.